Diva #185: Duo Tangle Phicops vs. Diva Dance…who won? It is OMG hot in Southern California right now. So what better to do than stay inside and tangle…opps…I meant do homework! So this week, our lovely Laura the Diva had us do a duo tangle with her tangles Phicops and Diva Dance, in celebration of her and B-rads anniversary. They are a lovely couple…and this pair of tangles are a lovely couple as well. This was a first time for Phicops for me…I did find it a little challenging at first. 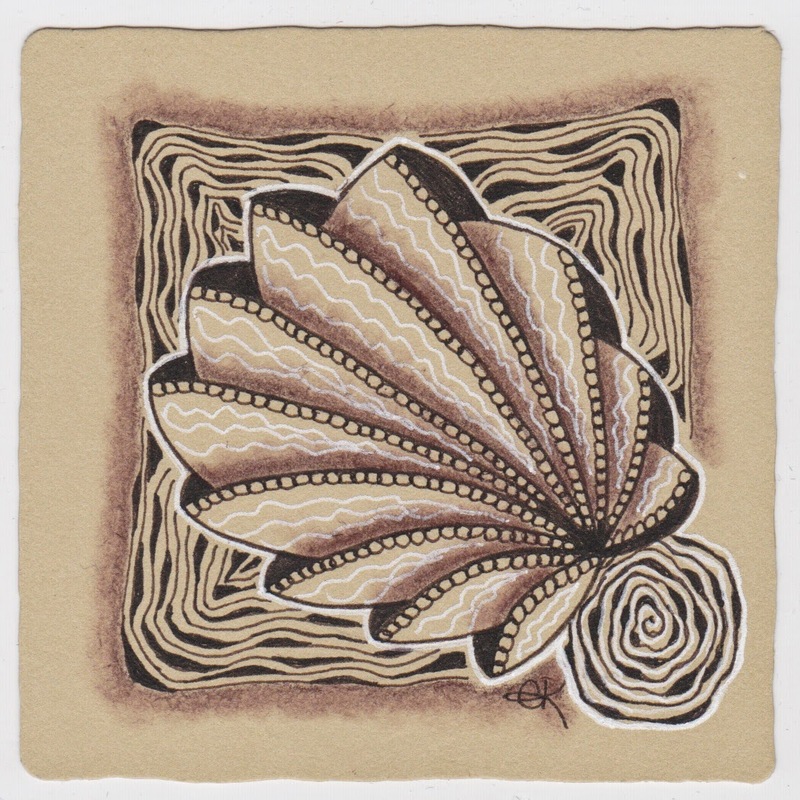 Renaissance Tan tile, with sepia micron, brown artist lead, and white Gelly Roll pen. I am trying to stay up with getting at least a few tiles a week done. I spent all last week prepping my demos for my first live demonstration yesterday (it was fabulous) so I didn’t really have time to get to last weeks Tickled to Tangle tile, but I did get this weeks done today as well. The tangles are Girlande, Girdy, and my almost oops variation of Gingham. Black micron, graphite, Inktense Pencils, and a Niji brush. ok…off to read stress management homework…write papers…and dream of ebola…ack! Your first time Phi Cops is a winner. A lovely Diva Challenge Tile. 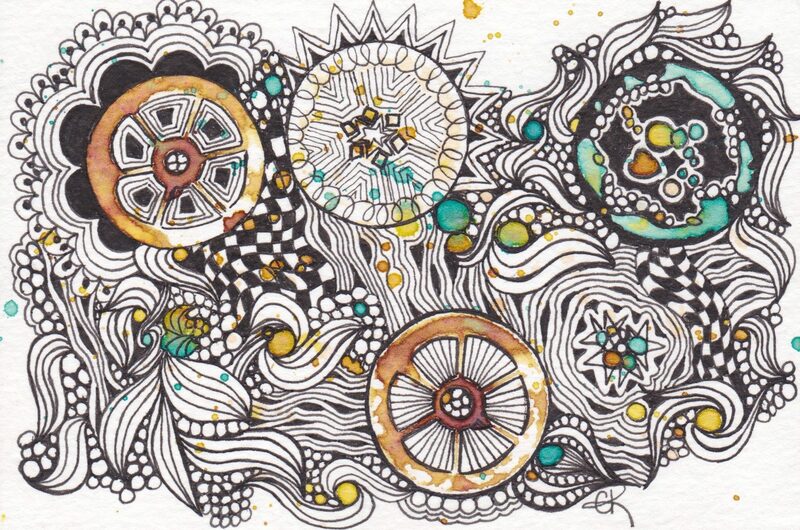 Love your white Gelly Roll Pen highlights. 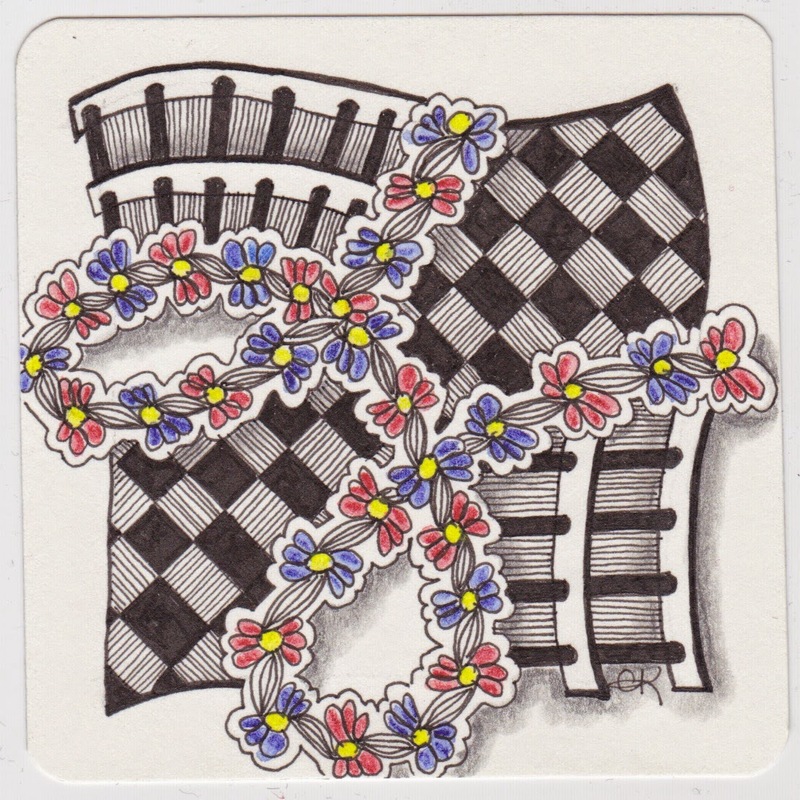 The Tickled to Tangle Tile is also lovely. Well done. Thank you David, you are always so generous with your compliments! Both of your tangles are exquisite. The Diva Dance/Phicops is really pretty with the white pen.I love the colorful Girlande in your second tile. The challenge tile you made is beautiful, The other one is great and very cheerful. They are both beautiful! What is Tickled to Tangle??? these are great. Your duo tangle reminds me of a jewelry box, with a precious brooch lying on an intricately woven cloth. The deep contrasts of the second one is striking, the b&w against the primary colors. Nice! Love your renaissance tile! The white highlights are fab! The added color in the second lovely! love your phicops. Now I have to change my tickled to tangle tile because I put the patterns in exactly the same places you did.! I even coloured the girlande. great minds…. I think you should send yours in too…it will be fun to see two similar ones from different people! Like your white highlights in the Phicops. My sister said she was trying to weather the heat also. Hope you get some relief soon. Donald…I gave my first demo this week at the Sew Hut in SD…their a/c had gone out the day before. My sweat was sweating!